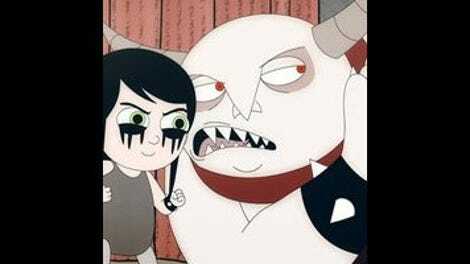 What if you were a lonely kid, and your imaginary friend were an intergalactic warlord with horns and a deep love of murder? What if he wasn’t imaginary? Though the show is named for the aforementioned warlord, Golan The Insatiable is at heart about the girl who summons him from his…home planet? Hell dimension? Whatever it is, it is unpleasant and Golan even more so, but Dylan still identifies with him way more than she ever has to the blandly smiling, round-bottomed citizens of Oak Grove, Minnesota. With her disdain for everyone around her and devotion to getting suspended from school every single day, Dylan comes from a longstanding tradition of diabolical animated children (see: Louise Belcher, Stewie Griffin). Still, the show manages to set Dylan apart from her peers with her dripping black eyes and her wholehearted embrace of not just the macabre, but also the homicidal (see: trapping an intergalactic warlord in Minnesota in the hopes that he’ll kill everyone). It may not surprise you that explaining the presence of a behemoth monster slash despot in a Minnesotan girl’s bedroom takes some time, but such is Golan The Insatiable’s challenge. The first incarnation of the show was originally just eleven minutes on Fox ADHD, and it didn’t bother to clue us in on how exactly Golan crashed into Oak Grove. Instead, Dylan and Golan started the series as a team that the town and her family just accepted. 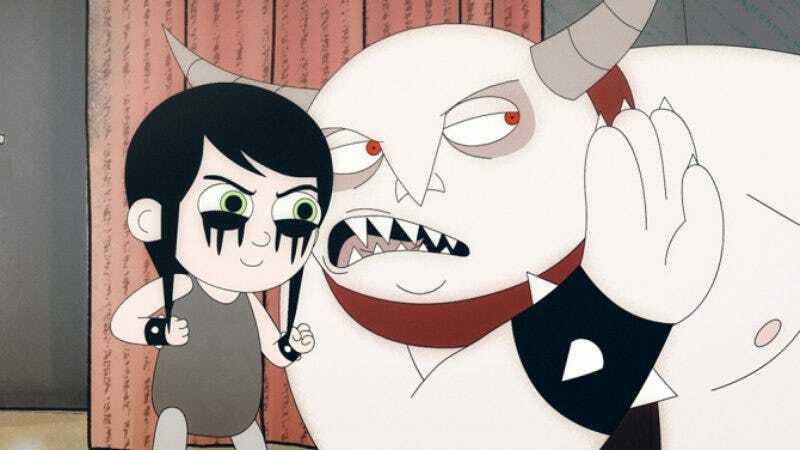 Since Golan The Insatiable has now made the jump to a primetime slot for a full half hour, though, the show decided to provide some kind of context for its hyper-surrealist premise and gives the backstory for Dylan and Golan’s unusual relationship. Another change from the original series is the voice cast. Co-creator Josh Miller used to voice Golan, but he has now handed the reins over to Rob Riggle. Miller’s original Golan was a lecherous grumbler; Riggle’s Golan is an explosive frat guy. Riggle is just about the best yeller in the business, so it’s no surprise that he takes the opportunity to voice a hedonistic beast, runs with it, and spikes it over the line. Much of the fun with Golan comes from the neat vocal hairpin turns Riggle can take from Golan’s fiery monologues to his bumbling misunderstandings. The other major change is Dylan, who is now voiced by Aubrey Plaza instead of Mary Mack. Plaza is known for deadpan characters like Parks and Recreation’s April Ludgate and Safety Not Guaranteed’s Darius, and Dylan is a Wednesday Addams stuck in Pleasantville, so it’s easy to assume she could keep things monosyllabic. Instead, she lifts her voice to a higher register that almost makes her unrecognizable and embraces the fun of playing a kid with no inhibitions or qualms about slapping a fireman with her own bleeding kidney. Maria Bamford, Ken Marino, John DiMaggio, and Rachel Butera round out the cast, giving the various residents of Oak Grove an extra shot of bonkers energy to match Golan and Dylan’s pitch black absurdity. (Dylan’s father, once voiced by co-creator Matthew Silverstein, has been cut from this half-hour version.) Bamford as Dylan’s mother Carole is especially fun as she tries to understand her unusual daughter and tentatively flirts with her new monstrous house guest. It’s unfortunate that the tricky premise of the pilot weighs it down with exposition and rushed resolutions, because the show lands most of its best jokes when it has room to just let its twisted characters clash against everyday life. There’s Golan storming into the town hall to demand a formal inquiry into his stolen spell book. There’s Dylan accidentally making her body unleash a series of horrors, like belching a stream of bats and an alien arm bursting out of her chest, which make her cackle with delight even though they hurt her “so much.” In one of the episode’s best visuals, Dylan sets her sister Alexis on fire in passing, causing Alexis to just sigh in exasperation before face-planting onto the hallway carpet to stop, drop, and roll. So yes, the pilot has a ton to get through: Dylan’s outcast status, Dylan summoning Golan, Dylan trying to keep Golan from going back to his kingdom, Golan realizing his kingdom doesn’t even want him anymore, Dylan and Golan realizing they need each other so they have someone who comes close to understanding them, etcetera and so on. But now that the stage is set, Golan The Insatiable has more space to let its characters play more—even if that means actual death and dismemberment for anyone who gets in their way. If you’d like to see Golan The Insatiable covered regularly, speak now. Corrected: Writer Nick Rutherford is stellar as Alexis’ slacker boyfriend, who Golan mistakes for a “nunchuck delivery guy,” and who later convinces Alexis that she will one day call this new boyfriend of her mother’s “dad” in a stirring, if terrified, speech.